Have a look at how DMM makes Karabinas and you’ll be amazed they’re so cheap in the shops! http://vimeo.com/1794697 from Dave Gill on Vimeo. Time has flewn past, even with the intermittently wet weather we've still had loads of great days out. Laura's been developing her lead climbing at Shepherd's Crag - Fisher's Folly and Kransic Krack (Borrowdale rock); at Trowbarrow - Jean Jeanie and Coral Sea (Limestone); I should mention that whilst JJ is a fantastic classic it will fall down one day, just make sure you're not there when it does! ; and at Castle Rock. She's learning fast and, additional to the above, we've climbed together in Langdale and on Idwal Slabs in Snowdonia. And I've managed to get out and climb more classic routes in between everything. It includes video about Inspecting Ropes, Helmets etc etc. haven't managed to look at it myself yet because of slow internet access here at a stiflingly hot German OutDoor trade show. I'm at a trade show, not open to the public, where everything Outdoor (Bikes to Bogey Boards; Bicycles to Bivy Bags; Fleece jackets to Family tents) is presented to European retailers and promote their products for 2011. When I get a quiet moment I'll be heading around this massive show to see what new wonderful climbing / scrambling / mountain gear might be coming out next year. A great group, it rained all day but nothing dampened their enthusiasm. Today we headed to Lower Scout in Langdale. We started with movement skills and body positioning on the lower boulders. Next we placed 'nuts and 'cams and built a belay. Then L used the retrievable abseil technique we practiced yesterday (with a prussick for safety) to abseil down a route, stopping to place gear and extenders. I then abseiled down, checking the gear and advising on positioning before L led the route on the gear they'd pre-placed. So from starting with a 'Diff' on Monday L is now leading Severe + and self-protecting on abseil. Today L practice, and did, a retrievable abseil, including the use of a prussick for self protection. Due to rain we went to Kendal Wall and climbed indoors, this included a 22 metre lead up a steep wall (French 5+ grade) by L.
With the (secretive) backup support of another instructor I took an opportunity to make a surprise fall from an overhanging wall so she could experience (and hold!) a falling lead climber. Apparently the fall was spectacular. Headed to Langdale to practice leading rock climbs. 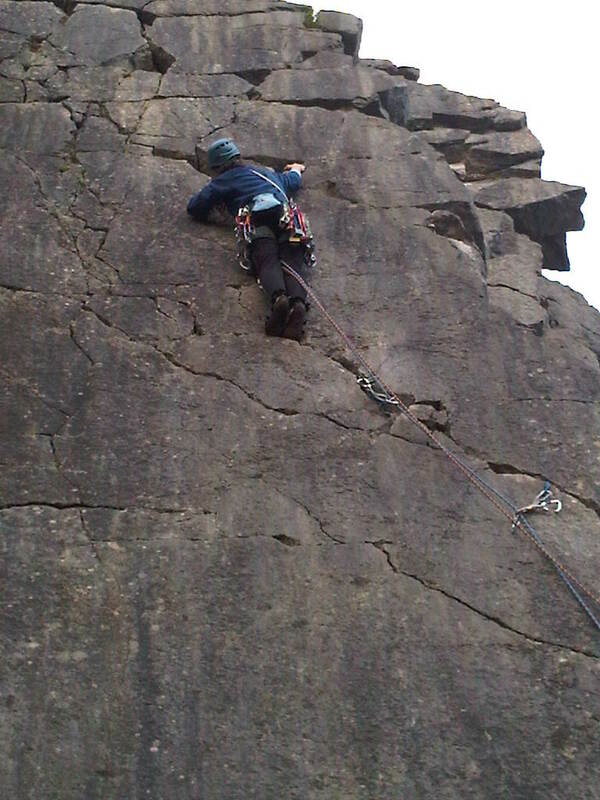 This was L's first lead climbing. Laura practicing leading on Raven Crag. Went to my daughters Annual General Inspection. They did extreemly well, the weather was perfect and the aircraft fly-past was superb. (Few photos because there are under 18's included).